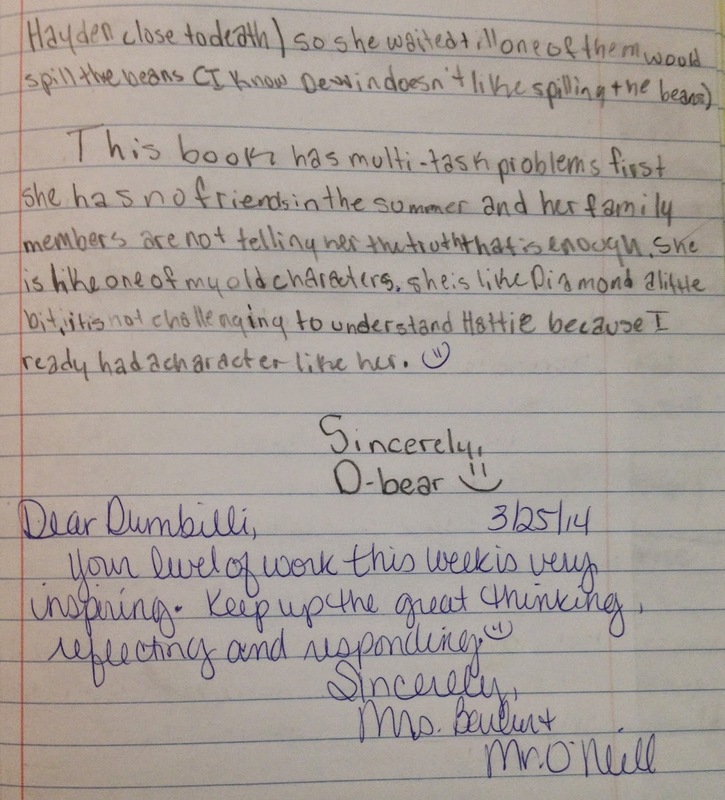 If you're currently reading this, you'll probably want to have made sure to have looked at July 28th's entry as Dumbilli began her 5th grade reading journey (her entries were from last August). If you have read it, you'll remember that she was lacking a focus. She was working with multiple texts throughout the week and even multiple strategies within the same entry (we're not against using multiple strategies and recognize that this is what advanced readers do, but wanted to see more depth from Dumbilli's work). Today, we'll take a look at the work Dumbilli was doing in March. Seven months had passed and you should immediately see that Dumbilli learned to slow down; to give herself the necessary time to do the level of thinking we were expecting of her and even more importantly, the thinking she now expected of herself. We have a quote in our classroom from Donalyn Miller's The Book Whisperer. It states, "Reading is the inhale and writing is the exhale." Dumbilli has taken this to heart as she is beginning Ann M. Martin's A Corner of the Universe. She's thinking about her reading, but she's doing so from a writer's stance as she attempts to determine what genre of writing her book may be. The graphic organizer provides evidence as to why it might be a personal narrative or possibly historical fiction. I really appreciate her last paragraph where she discusses how she'll have to read more and even states "The more you read, the more information you get." I don't think the entry above is Dumbilli's strongest effort. 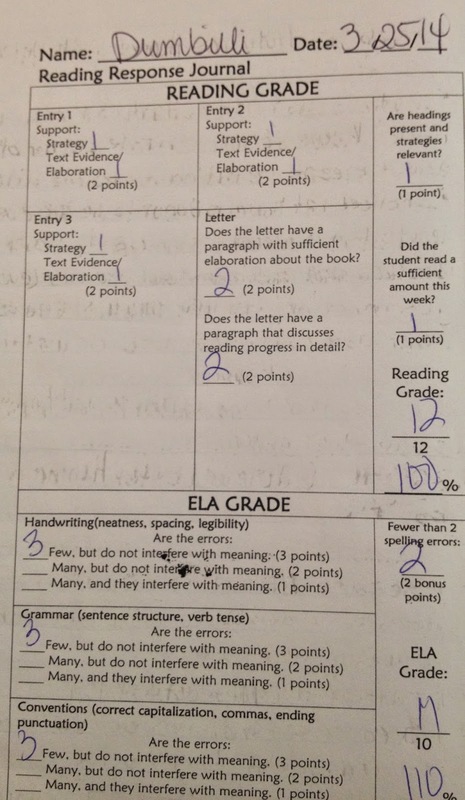 However, this is one of the many beautiful things about reading response journals! After this quick assessment of Dumbilli's work, this would guide our instruction. This would turn into either a small group conference if others were struggling with this strategy as well or a one-on-one conference if we did not feel others needed additional instruction with this type of work. I would start the conference by informing her that I appreciate that she was thinking of some of the cause and effect relationships occurring in her book, but was slightly confused with how they were connected. She very well may explain this perfectly during this conversation and if so, then that's what I would want to see in her writing. If she is not able to do so, then we would most likely refer to either previous books she has read to look more closely at cause and effect that occurs in those or perhaps the extended text we are sharing with the class at the moment. We would end the conference by urging Dumbilli to revisit this strategy; to continue to read with the lens of cause and effect. Dumbilli decided to compare characters within her story with this journal entry. 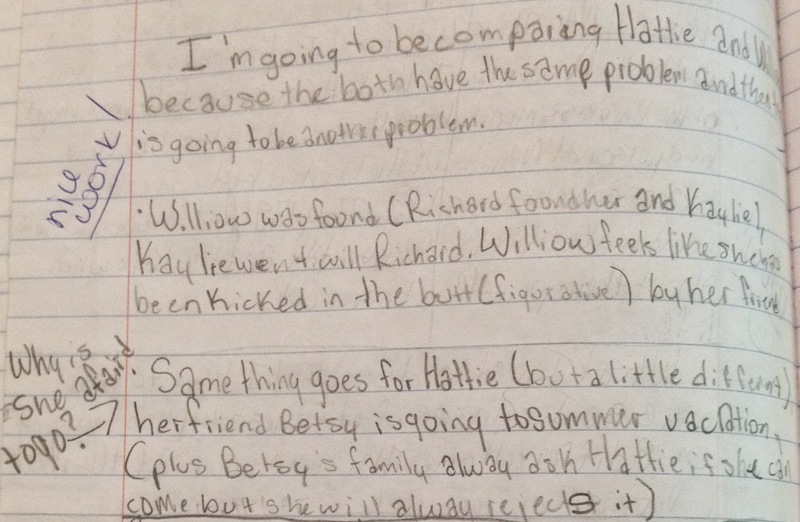 She discusses that both characters are facing a similar problem, but how Hattie's problem is slightly different. As much as I like the comparison, I really like the question she asked in the margin as well. 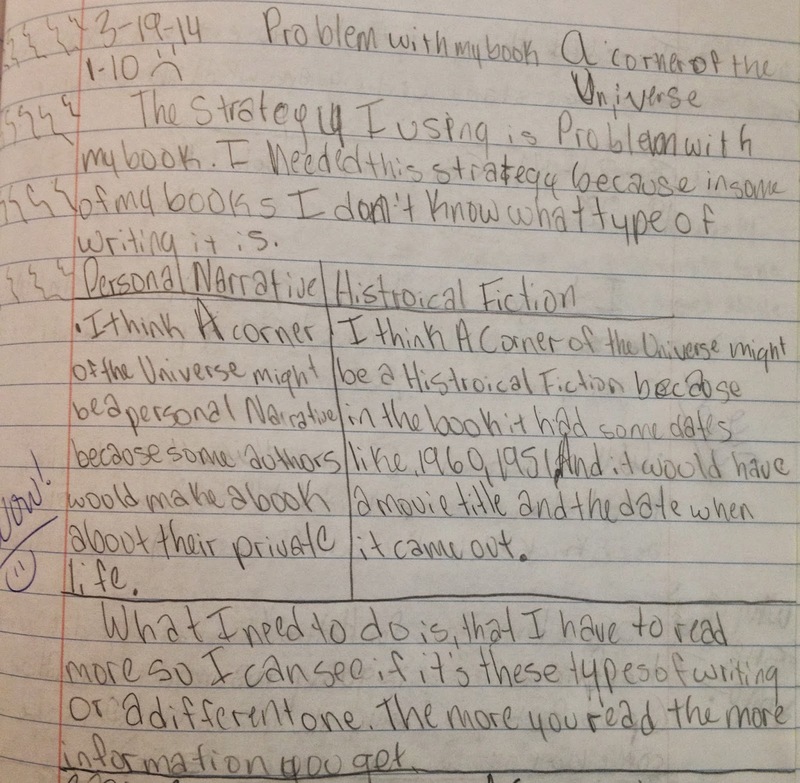 This is an example of her using multiple strategies, but now you can see her comparison has more depth than where she was as a reader earlier in the year. I think Dumbilli's second paragraph in her letter really shows how our readers at this point in the year have been able to progress. She mentions that Hattie is not difficult for her to understand because she reminds her of Diamond (from Helen Frost's Diamond Willow). The more books we read and the more characters we get to know, the more we understand "how stories go," as Lucy Calkins says. Progressing to this point, where Dumbilli understands "how stories go" have helped her strenghten not only her reading but her writing as well.